Next Friday, I'm going down to Brands Hatch race circuit to do a charity bike ride for Action for Children. We're using the shorter version of the track which is listed as being 1.2 miles long, in the photo below it's the bottom loop. I was excited about this when I first registered but since reading the names of all the iconic sections of track I'm overflowing with anticipation. 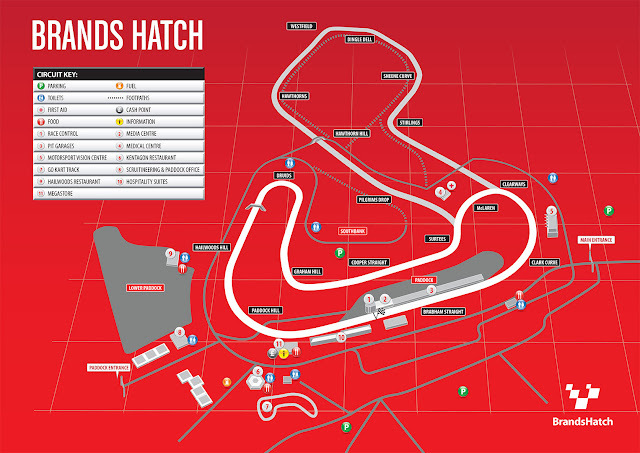 I've been to Brands Hatch once before and that was to watch something with motorbikes in it, it might have been Motocross or Supermoto - I have trouble remembering the differences between motorbike races. The deal is that I'll ride for two hours on the evening of Friday 13 September (lets hope that's not a bad omen). It's not a race, just a ride. However it would be nice if there is enough space on the track to be able to do a few time trial laps, or should I say 'hot laps'? I've agreed to raise some money for the charity so if you'd like to sponsor me just click on the button below. Thank you. I'm also having a little 'guess the number of laps' competition for everyone that sponsors me. So if you want to play, just sponsor me and let me know (here, on Facebook, Twitter or in person) how many 1.2 mile laps you think I'll do in the 2 hours. Thanks again. As usual I'll write a blog post about the ride and hopefully include lots of photos. I'm allowed to take as many spectators as a like so if any friends or family want to come along to hang out at this iconic place for a few hours just let me know. Of course if anyone else is interested in joining me in taking part, the Action for Children people might still be accepting new registrants via this page - Brands Hatch Bike Ride 2013.